Permit #: 2015- 766911Are you looking for contemporary Island style? The Malibu Beach Villa is your style!Your Malibu Beach townhouse offers stylish living for your group vacation or personal beach getaway in one of the Island's most popular seaside communities, The Villas of South Padre.Three levels of luxuriously appointed surroundings offer plenty of private space and room for gathering with your group. Custom wood flooring and cabinets, beautiful granite counters, contemporary fixtures, comfortable furnishings and a tasteful decor come together to make the Islander townhouse a classy seaside retreat.The first level combines a bedroom with a full bath and a spacious entryway that opens to a tropical backyard. Grill your favorite meals, soak up the Island sun or bask in the fresh ocean breezes from the privacy of your backyard getaway. Overlook the quintessential seaside neighborhood and pool area from the second level balconies off the living, dining and kitchen areas. A contemporary decor, comfortable furnishings and spacious areas invite you to gather in the open living and dining rooms of the second level. Prepare your favorite vacation meals in a gorgeous kitchen complete with state of the art appliances, roomy preparation areas and all the essentials you need. The third level is all about your rest and relaxation. Escape to a spacious master suite and pamper yourself in a luxurious private bath with a jetted tub, tiled, walk-in shower and double sinks. A cozy balcony offers a quiet retreat to complete your private escape. Your guests enjoy two comfortable bedrooms and share a Jack & Jill bath with a beautifully tiled, walk-in shower. Morning coffee and late night beverages are easily accessible from the wet bar, conveniently located between the master and guest bedrooms. The Villas of South Padre is located on the ocean front and is within convenient walking distance to the South Padre Island Birding and Nature Center, Sea Turtle, Inc., the South Padre Island Convention Centre and several, popular entertainment venues. A private beach access, tennis courts, large community swimming pool and a children's playground area make The Villas of South Padre one of the Island's favorite seaside communities. 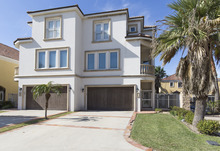 The Malibu Beach Villa, in The Villas of South Padre, is your contemporary Island style!